I have become very fond of rutabagas. 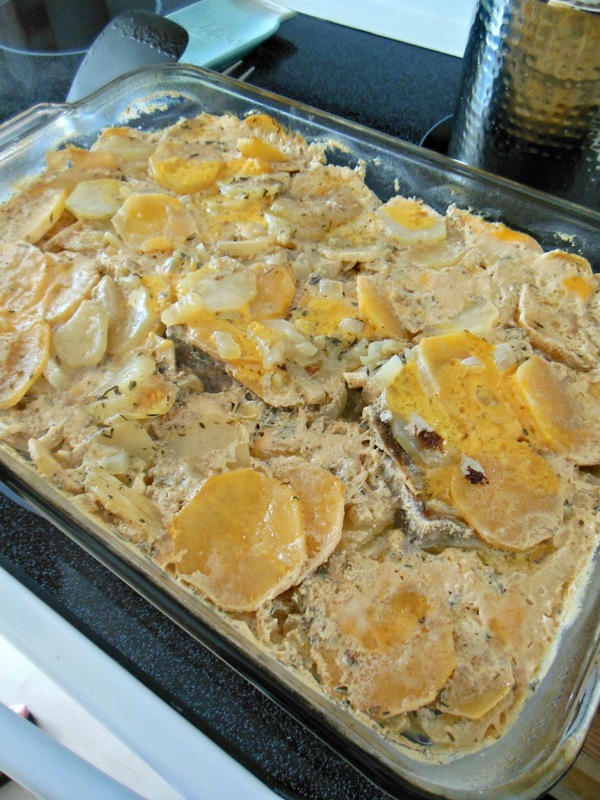 And they shine in Scalloped Potatoes and Rutabaga with Pork Chops Thyme and Cheddar Cheese. Rutabagas are not glamorous, that is for sure, but they are earthy and delicious. 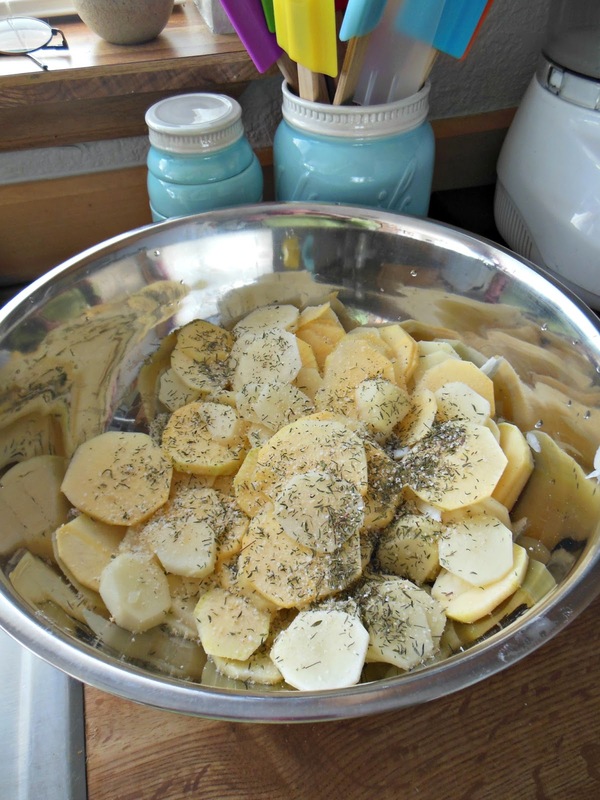 They are a delicious addition to any potato dish. 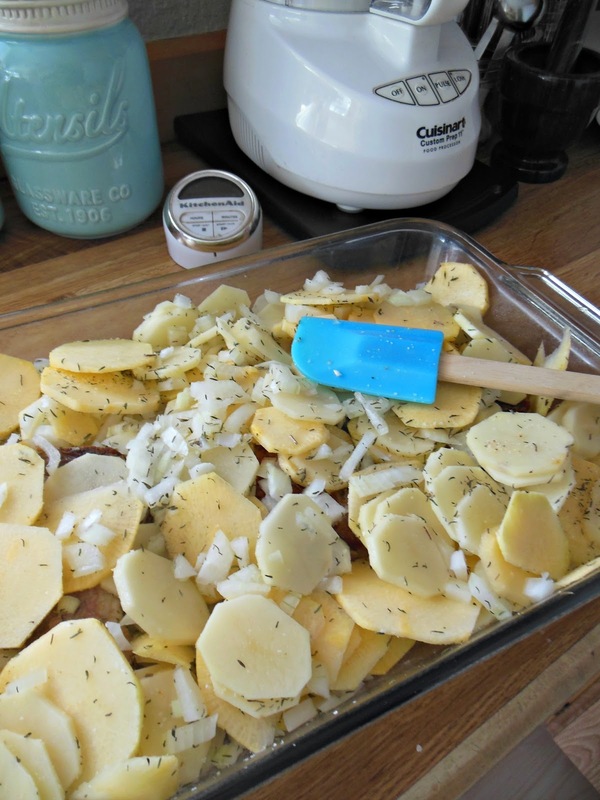 To make this dish our main course I including some pork chops for a one pan dinner. We served this dish with applesauce, but you could add a green vegetable also, it is up to you! 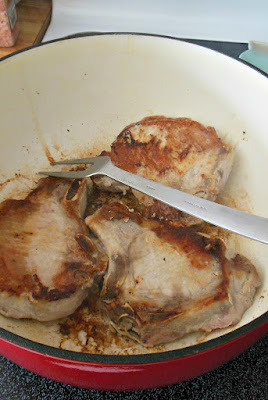 Season pork chops with salt and pepper, brown well, set aside. I had 3 thick chops in the freezer, this provided us with 2 meals. In a large baking dish add the pork chops to the bottom. Sprinkle with the diced cheddar cheese. In a large bowl, combine the potato slices, rutabaga slices and diced onions. Add a generous sprinkling of garlic salt and the thyme leaves crumbled. Toss around in the bowl to coat the vegetables with the seasonings. Cover the pork chops with the vegetables. the depth will accommodate all the liquid without a boil over on the bottom of the oven. Sprinkle the top with approximately 1/3 c flour, pour over the top the stock and the milk. Cover with a lid (or foil) and bake at 350 degrees for 2 hours. 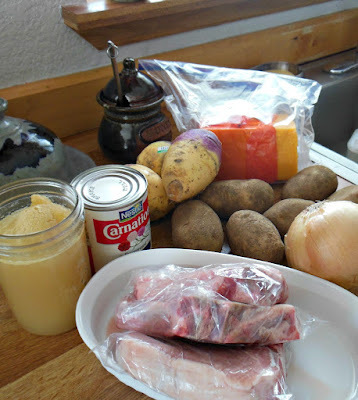 Remove the lid after 1 1/2 hours to evaporate some of the juices. Warning: not pretty, only delicious! you're right its not the prettiest meal but its a wonderful meal!